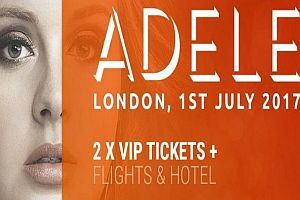 Bistarz Casino – one of the most well-known Bitcoin casinos online and a brand with a strong presence across the community, has recently launched a new raffle where the main prize is a VIP concert package for Adele’s upcoming Wembley Stadium London show on 1st of July. So, if you’re a Bitcoin gambler that’s also a fan of the pop diva’s work, you might want to head down to Bistarz Casino and sign up for the promotion. A multi-award winning singer, Adele has been breaking records since her first album and her concerts often sell out fast. In fact, they sell so fast that tickets for this particular concert sold out within 10 minutes of being released. But luckily, Bitstarz was able to grab 2 premium tickets in time to offer in the raffle to anyone who wants to join in the competition, and not just VIP players. To complement the experience, the casino also organized a complete VIP treatment for the lucky winner. So, should you win the prize, you’ll also get a plane ticket and accommodation in a 5 star hotel in London during your trip, on the house. Since there are two tickets to be won, the casino will also let you take any friend or partner with you to enjoy the concert and stay in London together. To get into the competition, the casino only requires you to make a deposit of €20, or any currency equivalent, and you’ll automatically get 1 ticket for the raffle. However, the deposit has to meet the €20 minimum – so a combination of two €10 deposits, for example, won’t meet the criteria, but a deposit of €40 will get you two tickets. As a plus, you will be able to get as many tickets for the raffle as you want, since there are no limits. The competition will run from June 1st to June 22nd at 00:01 CET (Central European Time). When the timer expires, Bitstarz’ computer system will automatically draw the winner and announce the username publicly the very next morning. Each ticket you earn will automatically get added to a ticket counter that can be found in your player profile at the casino. If you’re lucky enough to win, you’ll get contacted by the staff on the next day after the promotion ends. The full prize will be 2 VIP tickets for the concert at Wembley Stadium (Sector 120), plus 2 airplane tickets with a total combined value of €2,500, or any currency equivalent, as well as a 3 night stay at a 5 star hotel in the city. The airplane tickets are not restricted to any location, so you can claim them wherever you live. Also, the prize cannot be compensated for in cash nor can it be given to someone as a gift. If you’re interested in this one-of-a-kind opportunity, you’d need to register at Bitstarz first. The casino has over 850 games on tap, including hit games from names like NetEnt, Microgaming, and SoftSwiss and they’ve also added a live dealer casino to their offer. There are also plenty of other promotions to be enjoyed, apart from the prize raffle. To visit the casino and browse through its offer, simply click this link here.